Online retailer Outdoor Trunk has launched “Season in a Trunk” – the first seasonal home décor collection handpicked by designers and shipped direct to the customers’ door starting September 8th. 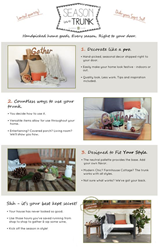 Created to work with any decor style, customers will find ideas and inspiration via the website on how to build off the season's trunk with additional items or from what they already have. Season in a Trunk takes the guesswork out of seasonal decorating. Online retailer Outdoor Trunk has launched “Season in a Trunk” – the first seasonal home décor collection handpicked by designers and shipped direct to the customers’ door and is available exclusively at OutdoorTrunk.com. “Season in a Trunk takes the guesswork out of seasonal decorating,” says Christa Melton, Outdoor Trunk’s Founder and brainchild behind this latest revolution in DIY design. “Every season, customer’s receive their own personal trunk filled with décor hand selected with the latest colors, textures, and hottest items for that season – delivered direct to their door. The neutral palette of the Trunk provides the base. Customers add their own flavor through what they already have or through inspiration provided on the website," Melton adds. Season in a Trunk is the first of its kind in DIY décor and Melton says initial feedback has been positive. Customers love the value of the product as well as the time savings of not having to shop for hours to create a designer look in record time. Priced at $199, pre-orders launch September 3, 2014 with shipments starting September 8th.